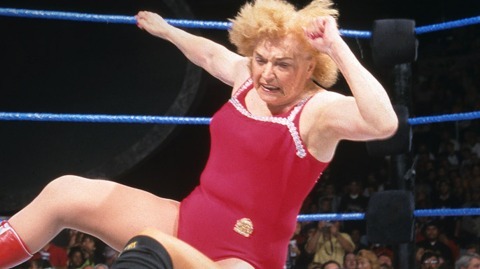 WWE Hall of Famer Mae Young has passed away at the age of 90. Our deepest condolences go out to all her family and friends. Mae was one of the few “active” Golden Era performers left. Her contributions during the Attitude Era were a delightful combination of absurd and offensive. And she did it all with a smile. I will release a full post on Mae Young sometime early next week. In the meantime, enjoy Mae doing what she was known for, wrestling beyond her prime!